Wow! A few days ago Lisa pointed out that we haven’t updated the food blog in over two months — now, lest you think we’ve been dying of hunger, don’t despair. We’ve just been rotating through a few old favorites while we’ve been preparing for our new arrival (We [Heart] Baby Food, anyone? )… so we’re still here! I adapted this recipe from one found in The Fishes & Dishes Cookbook: Seafood Recipes and Salty Stories from Alaska’s Commercial Fisherwomen — I got to meet one of the authors when we picked this up at our local Whole Foods. The book is filled with easy recipes that highlight fresh seafood — so far, every one we’ve tried has been delicious. 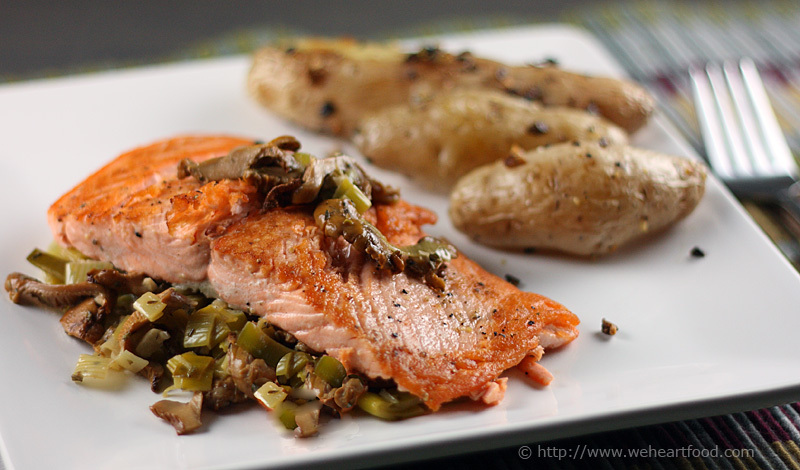 Here, coho is pan-seared, then finished in the oven, and placed atop a bed of sauteed leeks and chanterelle mushrooms. We served it alongside some roasted fingerling potatoes — yum! I don’t remember what we discussed when we had this, other than it was delicious. …and that you loved the potatoes. Well, obviously. They were covered with crispy garlic. I did like the how the outside of the salmon was crispy from the pan-sear — and still moist inside. And anytime you add mushrooms to a dish, I’m there. You and me both, sucka. Clean the leeks of all dirt and grit, rinse, and cut into 1/4″ rings. Season the salmon on both sides with salt and pepper. Heat a large skillet over medium-high heat, melt the butter, then add the leeks and garlic, cooking for 5 minutes. Add the mushrooms, stock, wine, and herbes de provence, and lower the heat to medium. Simmer until the leeks are very soft and most of the liquid has been absorbed, about 15 minutes. Add salt and pepper to taste, and keep warm over low heat. Meanwhile, preheat the oven to 475. Heat an ovenproof skillet over medium-high heat for several minutes, then add the oil and heat until it shimmers. Place the salmon fillets in the pan flesh-side down, and cook, without moving, for about 4 minutes. Flip the salmon over, place the pan in the oven, and let bake for 3 minutes. Spoon the leek/mushroom mixture onto serving plates, and top each with a salmon fillet. This entry was posted on Sunday, November 14th, 2010 at 5:45 pm	and is filed under Fishes & Dishes, Main Dishes. You can follow any responses to this entry through the RSS 2.0 feed. You can leave a response, or trackback from your own site. Looks excellent! I only recently started cooking with leeks, and now I’m addicted. And congrats on the baby news! Oh man! I have a serious salmon craving after seeing this. The leeks and the mushrooms sound like an amazing accompaniment. There is nothing in this dish that I would alter; perfectly balanced and the flavors are outstanding; congrats on the upcoming arrival!